I was invited to moderate a panel at the Goldman Sachs Cap Intro conference in Rome. 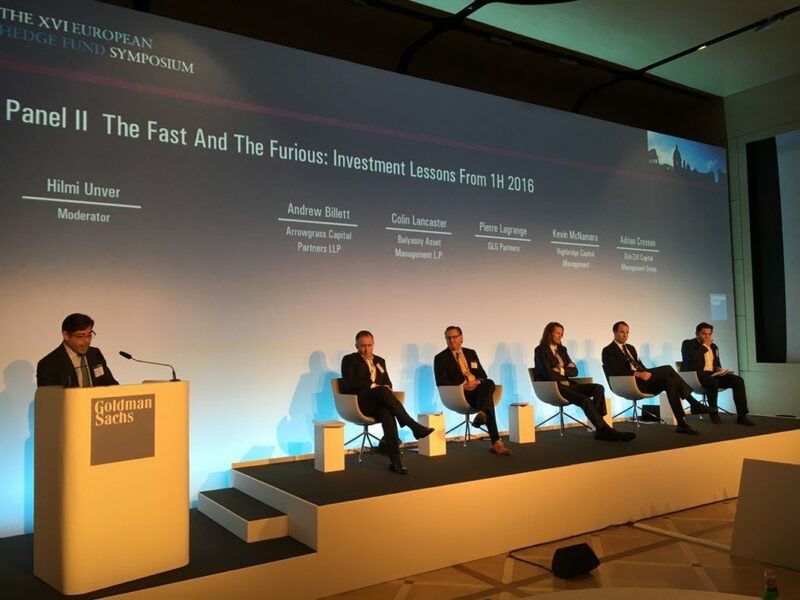 The Fast and the Furious panel – Lessons learned from Q1 2016. The panel was comprised of prestigious and longtime well established hedge fund managers; Andrew Billett from Arrowgrass Capital, Colin Lancaster from Balyasny Asset Management, Pierre Lagrange from GLG Partners, Kevin McNamara from Highbridge Capital and Adrian Croxson from Och-Ziff Management. This panel had the difficult task to explain or at least attempt to clarify what happened by taking a different angle, and touched on several issues that impacted capital markets during the first quarter of 2016. I opened the panel by changing the title to “The Fast and Frustrated” and by quoting Albert Einstein (1879 – 1955) who stated the following: “We cannot solve our problems with the same thinking we used when we created them”. One of the first points of contention was how hedge fund managers saw the USD and if they felt it was the single most important decision to get right regarding their portfolio? Clearly, the move in the USD over the last 24 months has been the biggest move for most investment professionals who are currently active. For most of them, they ended making a factor bet on the USD. The USD index quickly gained 25% which got translated into fears of a slowdown in global growth – US and China impacted by stronger currencies. This turned to be a macro call and most of the Fund Managers made investments in consumer discretionary, utilities, tech, healthcare and banks while they shorted (or avoided) miners, commodities and emerging markets. On the other hand, China in January 2016 weakened its currency and high yield suffered due to lower oil price. In February and March, we experienced a massive reversal with the Fed turning to a more dovish stance in January. This reversal took place for one simple reason… the USD. We then looked at the investor base asking whether its level of sophistication has improved. According to a study, in 1987 there were about 15,000 people that were Chartered Financial Analysts (CFA). Today, that number went up to close to 135,000. By the same token, private investors were largely replaced by institutions that are more concerned by volatility and closely monitor Sharpe ratios. Historically, we had discussions with managers and when we experienced a drawdown, we were more interested if that drawdown was an opportunity to add with the manager or not. Today, a sell trigger is pulled and questions are asked later. We see a similar response with bad news in the press. We also addressed the issue of consensual behavior by investors as per the increased use of ETFs. Is it funneling to be invested in the same names and sectors? It was also my view that in this low interest rate environment, fees need to be adjusted in order to enhance performance. It was also my view that portfolio and position sizing as well as leverage are becoming an issue. There’s simply too much money chasing the same ideas with a dwindling opportunity set. We were then asked to opine on the difference between US managers versus their European counterparts. My view is that there’s better dispersion in Europe and better returns. The opportunity set in the US is smaller than people think leading managers there to take bets that are more macro in nature. Managers in the States may therefore be leaving their comfort zone. We closed the panel on the issue of transparency. Was it becoming an issue with too much information circulating in the hands of peers? As investors, it’s important to note transparency is a good thing but depending on size and strategy, this may be a problem. We got a great feedback as the floor felt that the questions were very appropriate and needed to be addressed. I would like again through these few lines to thank Goldman Sachs for organizing such a great event and for asking me to moderate the panel.